God's will is my will. We are all strings in the concert of God's joy. All that the self does outside of God's will occurs in fantasy. What now seems hard to you, you will later learn to love the most. Not I, the I that I am, know these things; but God knows them in me. God has not created us for self-dominion, but as instruments of his wonder. I, God, press through your branches into the sap and bear fruit on your boughs. 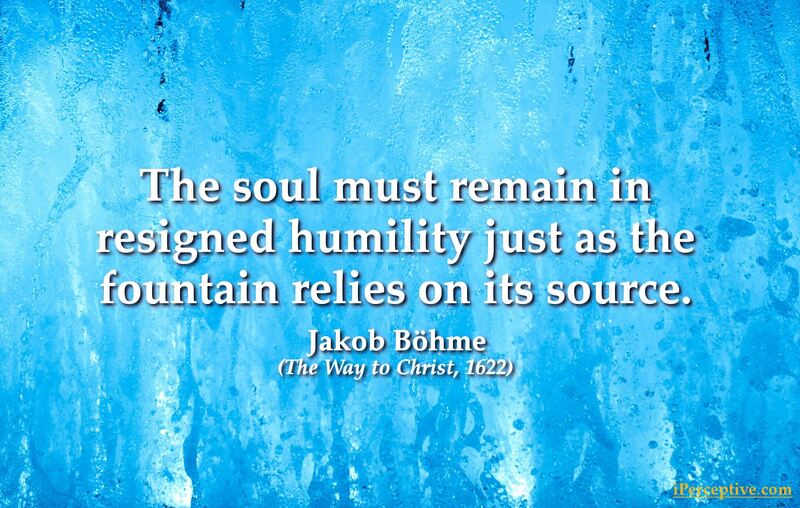 The soul must remain in resigned humility just as the fountain relies on its source. And so the eternal delight became perceivable, and the perceiving of the Unity is called love. When God's love completely dwells in a soul, it is in heaven and is itself God's heaven in which He dwells. Heaven is nothing other than a revelation of the Eternal One, where everything works and wills in silent love..
We men have one book in common which points to God. Each has it within himself, which is the priceless Name of God. No work outside of God's will can reach God's Kingdom. It is all only a useless carving in the great laboriousness of man. There is no place of rest in the earthly self-hood, but only in the fair solar lustre of his precious pearl; when the sun arises to him in the darkness, and the night departs. Here, now, is the right place for you to wrestle before the Divine face. If you remain firm, if you do not bend, you will see and perceive great wonders. You will discover how Christ will storm the hell in you and will break your beasts. For according to the outward man, we are in this world, and according to the inward man, we are in the inward world.... Since then we are generated out of both worlds, we speak in two languages, and we must be understood also by two languages. There is a certain Greatness and Latitude of Heart in Love, which is inexpressible; for it enlarges the Soul as wide as the whole Creation of God. And this shall be truly experienced by thee, beyond all Words, when the Throne of Love shall be set up in thy Heart. The whole host of heaven is set and tuned into one harmony; each angelical kingdom into a peculiar instrument, but all mutually composed into one music, into the only love-voice of God: Every string of this melody exalts and rejoices the other; and it is only a mere ravishing lovely and delightful hearing. My spirit has broken through the gates of hell and into the innermost birth of the Godhead, where it was received with love, the way a bridegroom embraces his dear bride. But this triumph in the spirit I cannot express by the written or spoken word; indeed it cannot be compared with anything but the birth of life in the midst of death, and with the resurrection of the dead. In this light, my spirit has right away seen through everything, and in all creatures, even in herbs and grass, it has seen God: who he is, how he is, and what his will is. We are all strings in the concert of his joy; the spirit from his mouth strikes the note and tune of our strings. Therefore God became man, that he might repair his glorious instrument of praise, which would not sound according to the desire of his joy and of his love. He would bring again the true love-sound into the strings; he has brought the voice which sounds in his presence again into us; he is become that which I am and has made me that which he is, so I may say that in my humility I am in him his trumpet and the sound of his instrument and his divine voice. Cease but from thine own Activity, steadfastly fixing thine eye upon one point, and with a strong purpose relying upon the promised grace of God in Christ, to bring thee out of thy darkness into His marvellous light. For this end gather in all thy thoughts, and by faith press into the Centre, laying hold upon the Word of God, which is infallible, and which hath called thee. Be thou then obedient to this call; and be silent before the Lord, sitting alone with Him in thy inmost and most hidden cell, thy mind being centrally united in itself, and attending His will in the patience of Hope. So shall thy light break forth as the morning; and after the redness thereof is passed, the Sun Himself, which thou waitest for, shall arise unto thee, and under His most healing wings thou shalt greatly rejoice; ascending and descending in His bright and salutiferous beams. Behold this is the true supersensual ground of life. 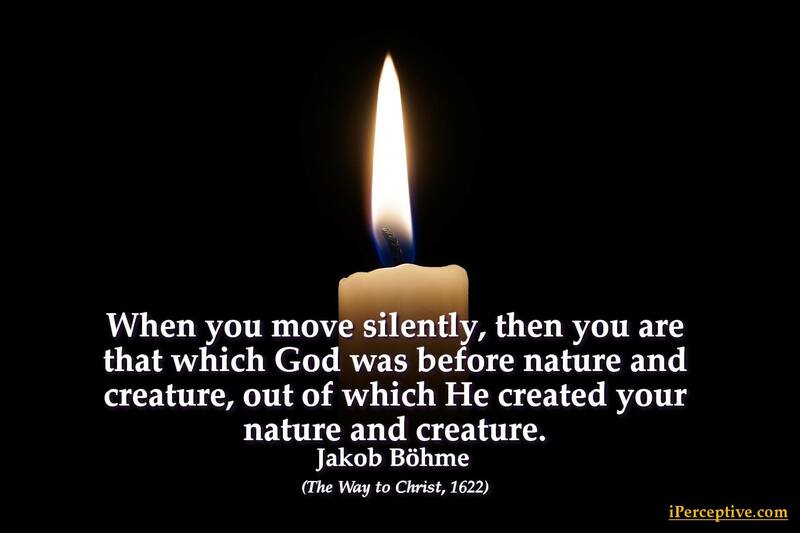 Jakob Böhme was a German Christian mystic. 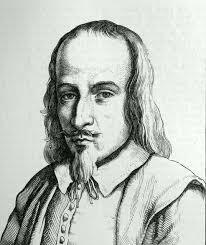 He is best known for his original thinking during his time and for his powerful expressions of mysticism.